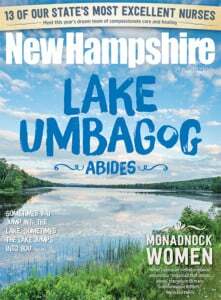 New Hampshire’s people of the year rarely toot their own horns, but they usually do march to the beat of a different drummer. Or sometimes they ARE the different drummers (like the guys leading of this year's list). Bad news seems to have become the norm for America, even in the entertainment industry. Justin Spencer of famed junk-rock quartet Recycled Percussion thinks he knows why: If you want some good news, you’ve got to go out and make it yourself. That’s what he and his merry band have been doing for the last year in their travels around the country, always returning to their home state of New Hampshire, taking time along the way to delight fans with benefits and fundraisers for local causes. It’s been 22 years since the founding of Recycled Percussion and the band just keeps getting bigger in terms of following and vision. “What other band can say that?” asks Spencer. And while the unique path of RP from a Goffstown High School talent show to a residency on the Las Vegas Strip may have been unpredictable, the constant has always been the unquenchable energy of Spencer and his bandmates. Notable among those is Spencer’s cousin Ryan Vezina, who is his production partner for “Chaos and Kindness,” a half-hour, independently produced TV show that has been airing monthly on WMUR Channel 9. The show is a hit (and just renewed for 20 more episodes) because it reveals just how much fun you can have doing good deeds for others. Plans are underway to take the show on the road to other states and maybe a few other countries, like Africa and Central America, where an infectious dose of “Chaos and Kindness” could go a long way to putting bad news on the run. The Currier Museum of Art in Manchester is a point of pride for New Hampshire. This internationally renowned cultural gem is home to works of art by European and American artists, including giants such as Monet, Picasso, Georgia O’Keeffe and Andrew Wyeth. Don’t get us wrong, that’s reason enough to visit, but the Currier’s new director and CEO, Alan Chong, wants it to be something more — a community center of sorts, where people gather to, yes, experience art, but to also have fun while doing so. Case in point was the recent Moulin Rouge event, replete with can-can dancers, aerial performers, fire throwing (don’t worry, that took place outside), dancing, music and food. It was all to celebrate the exhibit “The Paris of Toulouse-Lautrec.” There’s something for everyone here — the Currier After Hours series (past events include craft beer tastings and holiday fairs) that feature local musicians, the always-popular jazz brunches, art classes and workshops, family programs such as Storytime in the Gallery and so much more. It’s all aimed at making the museum accessible to everyone — you don’t need a degree in art history to enjoy what’s happening at the Currier. Last fall, we asked writer and photographer team Maggie Wallace and Jasmine Inglesmith to take on a difficult task — produce a story on youth homelessness. With the help of Child and Family Services, Wallace and Inglesmith met with teens in Manchester, learning about their experiences, struggles, hopes and dreams. Instead of a dry story filled with statistics and quotes from officials, they created a window into youth homelessness through the eyes of kids living that reality. New Hampshire is known for its lush forests, rugged mountains and beautiful scenery, but it also might become known for its hit series, “North Woods Law: New Hampshire.” The stars of this Animal Planet show are New Hampshire Fish and Game conservation officers. Viewers follow along as the officers go about their duties, which range from enforcing wildlife and fisheries laws to search-and-rescue operations and responding to public calls. It has received positive feedback, and the officers in the show have even been recognized outside of the Sunday Animal Planet episodes. Whether officers are saving sick loons, dealing with illegal bobcat trappers or even climbing into the treetops to deal with an aggressive hawk, they are heroes working tirelessly to serve and protect the Granite State. Since November 2016, citizens across New Hampshire have been more divided than ever when it comes to civics-related issues, and many feel as though their voices don’t matter. Enter Martha Madsen, who is here to change that. Madsen is the president of the NH Institute for Civics Education, an organization that is dedicated to reinvigorating the teaching of civics in New Hampshire. She aims to improve civics education through a professional development program for teachers from K-12 grades, and by sharing high-quality curriculums, which are based on current best practices. Whether it is engaging people at public events or offering free training and workshops to educators, the NHICE has its sights set on making the state first in the nation in citizenship preparation. “Isn’t the word ‘can’t’ an incredible invitation?” asks Mary Jo Brown. The owner of two successful businesses, catalyst and chair for the NH Women’s Foundation, and a board member of the NH Charitable Foundation, Brown also finds the time to be a single mom, a professional photographer and an unflappable source of optimism. Her design company’s local handiwork appears on Moat Mountain beer and The Music Hall, and perhaps most recognizably in the famous logo and branding for Planet Fitness — that’s right, the big, yellow thumbs-up — but Brown & Company Design also donates design services at reduced rates to nonprofits such as CASA and New Hampshire Humanities. “I believe that business can be a force for good,” says Brown. She has taken this philosophy to heart, creating a legacy of philanthropy throughout her career. Most notably, as chair of the Women’s Initiative, she spearheaded mergers in 2012 and 2014 that unified five major women’s groups into one umbrella organization, the NH Women’s Foundation, to focus on research, education, advocacy and grant-making services for the women and girls of New Hampshire. She started as a staff member for the NH Humanities Council 22 years ago, eventually taking over as director in 2004. Since then, the council, long a key player in the state’s cultural fabric, has distinguished and updated itself, tackling the big issues of the past decade with a remarkable blend of passion and sanity. That blend is a pretty good description of the role that the humanities can play in modern life, where too often even our virtues are played against one another to lure eyeballs or encourage click-throughs. This year, she’s leaving the recently renamed and beautifully rebranded NH Humanities organization to work for FoodCorps in Boston. At the NH Humanities’ annual dinner in October, she was recognized with a standing ovation and a keepsake box from the League of NH Craftsmen. She downplayed any special gifts that might be responsible for the successful years behind her, claiming only the charm of knowing how to hire a great staff, all longtime colleagues and friends. That core group of fellow humanitarians, or “humans” as they call one another, are perhaps Watrous’ most important contribution, carrying on for NH as she moves on to new challenges. Robert Azzi, a Nieman Fellow in Journalism at Harvard and once advisor to Tufts Fletcher School on Islam and leadership council member for the Harvard Divinity School, is proud of his Lebanese-American heritage, but he was born in Manchester and attended the Congregational Church and Sunday school. Then, while spending time in the Middle East in the early 1970s surrounded by Muslim friends and families, he came to appreciate the dignity of Islamic life and the respect Muslims he met held for all people. There was daily prayer and no need for an intermediary, priest or bishop to relate personally to the Creator. After a while he read the Koran and found it “beautiful and revealing in its repeated message of faith and mercy and justice and forgiveness,” says Azzi. So he converted. Now those early experiences form the outline for a series of town hall meetings titled “Ask a Muslim Anything,” in which he opens his heart and mind to all comers and all questions. As a result of stories on WBUR and National Public Radio, word of his sessions has spread far. Recently a reporter from an Austrian newspaper traveled to interview him. He says that while some questioners come with “a sheaf of notes” citing horrors from the news and history, he works to contextualize their concerns. “Muslims weren’t the only people waging war in name of God,” he says. And he has found that people listen to answers once you listen to their questions. “No one has stormed out of a meeting yet,” he says. Having spent the better part of the last decade establishing his Tuscan Kitchen brand in New England, Faro is about to bring major change to southern New Hampshire. After selling his popular line of sauces and Italian products to Nestlé, Faro retired — for a moment — in his early 30s. But he was soon back at work, opening the first Tuscan Kitchen Restaurant in Salem in 2010 (the market opened in 2012). Faro and his team quickly built a following in the region for his family-first and from-scratch-cuisine vision of Italian culinary fare, opening more locations in Portsmouth and Burlington, Massachusetts, with yet a fourth under construction in Boston. For most, that would be enough to start resting on one’s laurels. But Faro and his team are in the throes of developing Tuscan Village, an ambitious and potentially region-altering development project at the old Rockingham Park racetrack grounds. The megacenter of life, work and play will include a 42,000-square-foot Tuscan Kitchen Restaurant and Market, which will anchor the 1.1 million square feet of general retail space (think cinema, bowling alley, supermarkets and storefronts), a hotel and more than 350 living units (townhouses and apartments). When completed, it will be the largest of its kind in New England. Dan grew up in Manchester (and is now the Manchester Arts Commission chair) but he met Katie during their salad days in the Boston area. They worked together on the Boston Creative Pro User Group,­ a collaborative he managed for digital filmmakers and broadcasters, so they decided to see if they could instigate that same kind of creative ferment back in Dan's home turf. The result is Jupiter Hall, a new gallery/performance space/classroom/creative center that opened September 18 on Hanover Street, smack in the center of the Manchester arts district. The timing couldn’t be more perfect as the city has begun to flex its cultural muscles. Their vision is to tap into some of the excitement and panache that a big-city arts center offers and use that as a catalyst for uniting the various artistic factions of Manchester, including schools like the sprawling NH Institute of Art, SNHU and the growing footprint of UNH Manchester. “We want to be an incubator,” says Katie, “to bundle different ages, cultures and communities together to work on ideas and get out of their creative blocks.” And those “blocks” include city problems and opportunities of all sorts, from merging immigrants into community life to tackling the opioid crisis. “We’re putting skin in the game,” says Dan, “and trying to find ways for art and culture to be part of the answer.” Although all art, from spoken word to installations, will be part of the mix, the couple’s original interest in digital arts and video is the focus and plans are in the works for a new film festival, in partnership with the Palace Theatre, scheduled for next August. The digital divide is a concept born early in the history of the personal computer, but it made a quantum leap with the expansion of the internet as a global hive mind with astonishing reach and resources. It’s now practically assumed that a person has access to the web for everything from job applications to registering for social services, so what happens to those who can’t afford the luxury of a laptop or PC? Thankfully, in New Hampshire, there’s a company for that. “What is truth?” asked Pontius Pilate at the trial of Jesus Christ. You’d think that in the past two millennia we’d have gotten better at knowing, but technology is a two-edged sword in this respect. “The forensics guy and the forger share similar skillsets,” says Hany Farid, a professor of computer science at Dartmouth College who is one of the foremost experts on unraveling the digital mazes constructed to conceal or alter images and sound. And tools of the trade that once belonged to the hacker are now available at the app store. Some It Listers are perennial in the power and influence of their works. Here are a few names that appear on our list so regularly that they deserve their own category. Dean Kamen has long lamented the fact that American fame tends to be lavished upon sports and film stars, while most high school students are hard-pressed to name more than a couple of the stars of science and engineering. Now, thanks to the success of his FIRST Robotics series and the over-hyping of his sometimes mocked (but still pretty darn cool) invention, the Segway, a substantial number of high school students have his name handy when that question comes up. But in New Hampshire, we know Kamen as not only a technical whiz, but also a visionary for the real estate where he has built his company DEKA Research and Development. Under his influence, the Manchester Millyard has transformed into a true tech magnet for other companies on the leading edge of science, and it was Kamen’s impact that turned the key on the Millyard’s latest asset, the new BioFabUSA, which operates under the Advanced Regenerative Manufacturing Institute (ARMI). To put it (very) simply, the mission is to create engineered tissue and organs to help injured soldiers. Calling him Dan Brown of Rye, New Hampshire, makes him sound a bit provincial. After all, he’s world famous for his books like “The Da Vinci Code,” “Angels and Demons” and “Inferno” (and the successful Hollywood franchise that they spawned). But like his lead character, Robert Langdon, Brown at heart is just an adventurous academic. Unlike the world-ranging Langdon, Brown has clung pretty tightly to his home turf. He was born at Exeter Hospital and taught at Phillips Exeter Academy where his father was a professor for nearly 30 years. His early fascination with puzzles (encouraged by his parents) could explain why he has made the unraveling of historical and cosmic riddles into a personal literary mission. He’s stirred up plenty of controversy over the years with the focus of his unravelings, and that’s certain to be the case again with his latest book, “Origin,” in which Langdon perilously navigates the evolutionary-creationist debate and the question of how the questing, puzzle-solving mind itself came into being. As the debate about artificial intelligence becomes less academic and more practical (and controversial), a look back at the origins of real intelligence is more vital and relevant than ever. The remarkable span and scope of the documentaries of Ken Burns’ Florentine Films have created a film-based encyclopedia of American history. Within these visual volumes there are high and low points, one-offs and epics. Add to the list of masterpieces crafted by Burns and his associates the September release of “The Vietnam War.” It’s his latest collaboration with documentary historian Lynn Novick (she won an Emmy for producing Burns’ nine-part series, “Baseball”) and fills 18 hours with intensely watchable and challenging reporting about the military conflict that redefined America’s notions of war and reshaped the country’s self-image. There’s something funny in the water around Manchester: That might explain why three of the country’s premier comic voices all grew up in and around our Queen City. And in our stressed-out and anxiety-ridden age, providing a good laugh is almost equal to a public health program. Recent studies indicate that laughter, while maybe not the best medicine, does have real benefits to the heart, the immune system and the brain, boosting creativity and recall. Here’s an update on how our at-large humor therapists are doing.